I want to share some pictures of a parasitic wasp that I took up near Kinmount. 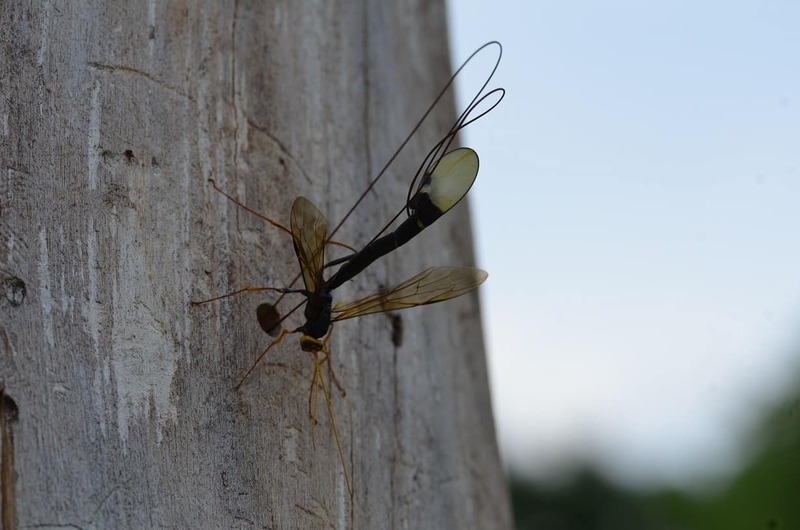 I haven’t been able to identify it, but this animal was about 3-4 cm long and had two ovipositors, each about 10 cm long. When I found it, it was busily probing a hole in a dead elm tree, presumably for some unfortunate insect larva on which it could lay its eggs. I watched it for several minutes and it reminded me of how Chimpanzees use sticks as tools to extract termites from termite mounds. She seemed to be methodically probing the inside of the hole in the tree. I hope you find these pictures as fascinating as I do.